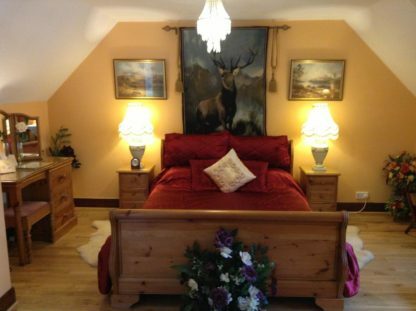 This luxurious, 4-star B&B has a tranquil setting on the banks of Loch Long overlooking the Arrochar Alps. It offers 2 spacious guest rooms with loch views, free Wi-Fi throughout and free secure parking. The property has a river running alongside and rooms at Burnbrae B&B each have a seating area for reading. Other benefits include tea and coffee making facilities, a TV, and a DVD player. Burnbrae B&B serves a delicious breakfast in the morning, with packed breakfasts and lunches available. The Village Inn, a well-known restaurant and pub, is right next door. The surrounding parkland is ideal for walking and cycling, and itineraries can be provided. Stirling is 1 hours drive away, while Glasgow, its popular shops and its airport, are within 50 minutes by car. Edinburgh and Fort William can also be reached by car in around 2 hours.